A ring of six bells was recorded in 1643, and was increased to eight in 1712 and then to ten in 1739-1740. Only the eighth has been subsequently recast, at the Taylor foundry in Oxford in 1828. Rather surprisingly, the oldest bell in the ring (the seventh) is the sole remaining bell of a ring of six cast for the Hospital that stood on this site and is dated c.1410 which predates the foundation of the College by 40 years! 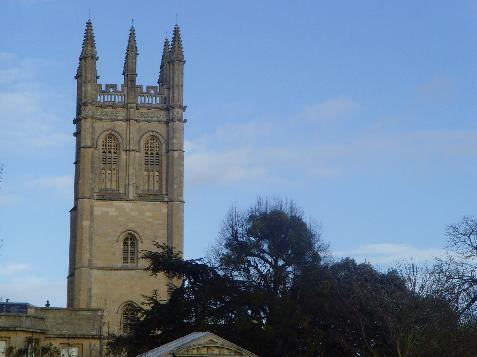 The tower celebrated its 500th anniversary during 2005. The bells were recently tuned and rehung on new fittings in the existing frame.